For Joanne and Daniel Tarrant of Newtown, Christmas 2008 was extra special. They celebrated the birth of Jesus Christ with the adoption of twins in the East African nation of Uganda. Nya Mary Grace and John Paul Kato, 20 months old, now are members of the Tarrant family. The official adoption did not happen on Christmas Day. It took weeks of working with the Ugandan High Court. However, the first time the Tarrants saw the twins was Christmas Eve. "They left for Uganda on Dec. 22 and arrived the morning of Christmas Eve," explained Father Joseph J. McLaughlin, pastor of St. Vincent de Paul Parish in Richboro, where the Tarrants are members. "Father Joseph (Sserugo) met them (at the airport in Entebbe) and drove them the five hours to Ibanda and they saw the twins before Christmas Vigil Mass." "Before Joanne and I were married, we had actually discussed international adoption and both of us were very open to it," Daniel said. "It just seemed like something God may have had in store for us. After being married for over three years, we began to pursue adoption seriously." Unable to conceive, the Tarrants focused on adoption around Christmas in 2007. "It was always in our hearts to adopt from Uganda, but on a practical level it seemed impossible," Daniel said. "However, God kept nudging our hearts and then later really confirmed His work in a powerful way, so who were we to say no? Really, all we did was say yes to God, and Jesus did everything else. I truly mean that." Uganda is a poor country beset with political violence. "The poverty in Uganda is astounding," Daniel said. "You can't really believe that people exist like that. It is humbling." Father McLaughlin and Father Sserugo are central figures in this story of love and commitment. In 1998, Father Sserugo, a Ugandan and priest of the order the Apostles of Jesus, first came to St. Vincent de Paul on a missionary appeal for a diocese in El Obeid, Sudan. According to Father McLaughlin, the parish began a relationship with Father Sserugo, who would return to St. Vincent de Paul each summer. "It was the parish's contribution to the universal Church," Father McLaughlin said. Father Sserugo was transferred to Ibanda, a district of Uganda, where he founded the St. Charles Lwanga Parish in Bubaale. "He would e-mail articles about his work," said Father McLaughlin. "One summer our youth group came back from a service week in Connellsville, Pa.," he said. "Father Sserugo celebrated Mass and commended the group. He said to them, Why not go to Uganda?" The following summer 17 people - adults and young people - made the trip. The group was attracted to the Ibanda Babies Home, an orphanage in the parish. "They were impressed with the work of the sisters (led by Sister Christine, the director of the orphanage) and edified by the generosity and joy of the people," Father McLaughlin recalled. Joanne Tarrant, 30, a graduate of Cabrini College who teaches Spanish in Lambertville, N.J., and Daniel, 34, a graduate of La Salle University who is a youth minister at his parish and a theology teacher at Archbishop Wood High School in Warminster, talked to members of the youth group, coordinated by Charles Ormsby, about Uganda. "On Joanne's birthday they prayed that the Lord would give them children," Father Mclaughlin said. This turned out to be a significant day. The pastor, later in conversation with Sister Christine at the orphanage, found out that twins had been brought there on Joanne's birthday (Aug. 4, 2007) by an elderly woman. The brother and sister, about two weeks old, had been left with the woman by their mother. "After laying the initial groundwork of discovering if we could even adopt from Ibanda Babies Home in Uganda, we filed our first official paperwork at the end of June 2008," Daniel said. The Tarrants' work with a lawyer in Kampala, Uganda, culminated with their Christmas Eve arrival in Ibanda. 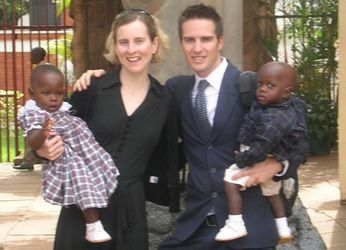 The adoption took place in Kampala on Jan. 28, 2009, with help from Sister Christine, who had to take a 10-hour roundtrip bus ride to Ibanda to pick up the necessary papers. The Tarrants and the twins returned to the United States on Feb. 6. Late in February, St. Vincent de Paul held a welcoming ceremony for the twins at Sunday Mass. The parish has contributed moral and financial support to the Tarrant Adoption Fund, Father McLaughlin said. "It's just that it's the right thing to do," he said. "A lot of neat things are happening. All we do is sow the seeds. Then the Holy Spirit takes care of it." "The twins' tribal names are Kato, the youngest of twins, and Nyangoma, the oldest of twins. The sisters baptized them John and Mary," Daniel said. "We wanted, first of all, for God to be at the heart of our adoption," he said. "And, secondly we wanted to fill as great a need as possible." That need was found in Uganda. Daniel's mother, Mary Tarrant, a member of Nativity of Our Lord Parish in Warminster, is acting as "grandma daycare" for the twins. "I know what it is like to love a wife and children in a third world country and feel so helpless and so fully dependent on God," Daniel said. "And I have come to see Jesus in the faces of people for whom it is hard to have hope. It is humbling and horrifying, and yet a gift at the same time. It makes me realize how blessed I am." © 2009 The Catholic Standard & Times. All rights reserved.